Aussie author Mirren Hogan is celebrating the release of her urban fantasy novel "Nightmares Rise". But I'm way behind on my promo activities so this blog is to showcase more of her historical fiction novel "Night Witches". You can read more about Mirren from the time she visited my virtual café for a coffee chat here. Little is known of the all-woman Russian aviators who flew bombing missions during World War II. From mechanics to navigators, pilots and officers, the 588th regiment was composed entirely of women. The 588th regiment flew 30,000 missions and dropped 23,000 tonnes of bombs on the Germans. The Night Witches developed the technique of flying close to their intended targets, then cutting their engines. Silently they would glide to their targets and release their bombs. Then they would restart their engines and fly away. The first warning the Germans had of an impending raid was the sound of the wind whistling against the wing bracing wires of the Po-2s, and by then it was too late. The Night Witches flew in planes made from canvas and balsawood. For the majority of the war, they had no radios, or parachutes. The latter was considered to take up too much space needed to carry bombs. Of three women's regiments, theirs was the only one who consisted entirely of women through the duration of the war. This is an incredible story of these women's bravery and skill that resonates even in today's society. 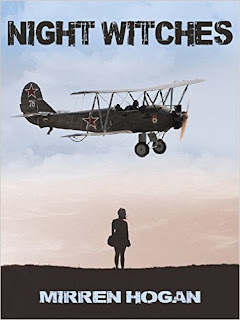 In this historical fiction novel by Mirren Hogan, "Night Witches" tells the story of Nadia Valinsky, a young female pilot and university education student from Moscow. When the Germans invade the Soviet Union in 1941, she wants to fight to defend her country. In October of 1941 Marina Raskova, a famous female aviator, asks for volunteers, Nadia signs up. She is accepted for an interview and offered a place in the training regiment as a navigator. Following rigorous training at Engles Air Force base, Nadia is assigned to the Night Bomber regiment. She and her crew fly multiple missions on the front lines and are regularly under fire from anti-aircraft guns. The Germans give them the nickname Night Witches, because of the sound their aircraft make as they sweep overhead. They lived together, fought together and died together. Searchlights lit up the sky, but they were looking where we had been. Antonina had restarted the engine and nimbly avoided them every time they moved. "This is too close," she declared, sounding breathless herself. Another couple of minutes and we'd be safely away. I swallowed hard and tried to force my heart to slow. I didn't want to come that close again. A second later, one of our bombs exploded, earlier than it should have. We used bombs with delayed fuses, deliberately set to go off once we were safely clear. We flew so low we could easily have been caught in the blast from our own bomb and blown out of the sky. As it was, the shockwaves from the explosion rocked the Po-2, making it shudder violently. Pieces of shrapnel flew up at us from below, tearing several small holes in the wings and a large one in the cockpit floor beside my feet. I felt a searing pain in my arm and leg and realised I'd been hit. A sudden burst of wet heat at the back of my left leg told me I was bleeding. I tugged off one of my gloves and reached down to feel a shard of metal sticking out of the underside of my calf. Although it hurt like nothing I'd ever experienced, I didn't dare to pull it out in case I bled even more. "Are you all right back there?" Antonina asked, so at least I knew she was alive. "I'm fine, but Valentina is going to be busy." That was true. The Po-2 could fly as normal, but the poor thing was going to need some patching up, as was I.
Mirren Hogan lives in NSW Australia with her husband, two daughters, dog, cat, rabbits and countless birds. She has a Bachelor of Arts (English/ history), a Graduate Diploma of Arts (writing) and a couple of degrees in education. She writes fantasy, urban fantasy and science fiction, as well as historical fiction. Her debut novel —Crimson Fire— was released in October 2016. Burning Willow Press will be releasing Nightmares Rise – co-authored by Erin Yoshikawa – on April 8. Mirren also had several short stories published and has co-edited two charity anthologies; for breast cancer research and Plan Australia.